London market broker Heath Lambert’s highest paid director had his pay slashed in half last year, 2010 accounts released last week revealed. The highest paid director’s take-home pay fell from £690,015 in 2009 to £383,419 last year, after he fell short of remuneration targets. The total amount the firm paid directors in bonuses and salaries fell sharply, from £1.713m to £696,517, although a number of directors – including former managing director Mike Bruce – were off the pay roll. The Companies House accounts showed that Heath Lambert’s operating profit surged from £3.6m in 2009 to £6.6m last year, helped by a reduction in administrative expenses. The broker posted an overall loss of £1.2m last year, when its hefty interest payments on debts were included. This follows a £3.3m loss in 2009. 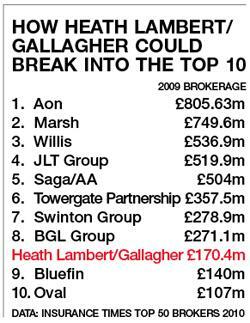 However, debts have been largely wiped out following Gallagher’s £97m cash acquisition of the firm. Heath Lambert chief executive Adrian Colosso scooped £964,608 from the deal, although his packet is thought to have been bolstered by his share in the Appleby Trust – the staff employee benefits fund – which received £8.2m for its shareholding.Chairman Keith Hamill pocketed £482,304m from the deal, according to regulatory filings in the USA. The biggest winner from the preference shares was Precis (2517) Ltd – made up of the government’s Pension Protection Fund (PPF) and RBS – which scooped £19.5m. A further £3.2m was handed over to Precis from the B shares. RBS and the PPF agreed a debt-for-equity swap with Heath Lambert in 2005, as the broker struggled with a £210m pension deficit that threatened to sink it. In a final twist to the deal, it emerged that Gallagher bought an indemnity policy from Chartis UK that protects it from Heath reneging on the tax and general warranties laid out in the agreement. A deductible of £800,000 was placed in escrow in case the policy was triggered. Gallagher rounded off an active week by purchasing Singapore broker ITI solutions. The acquisition will have the trading name Gallagher Singapore, and will be led by Freddie Lim, previously chief executive of ITI. Gallagher Singapore will work in the marine cargo, political risk and trade credit insurance sectors. It also has a separate Asian reinsurance licence. Gallagher (UK) chairman of international development John Hastings-Bass said Singapore was a “vital hub of activity” for their business. - Can Heath chief executive Adrian Colosso (below, left) and Gallagher boss David Ross (right) work together? Ross, largely from a wholesale background, will need to rely on Colosso's expertise in the retail sector. Both have strong personalities, so sparks could fly. - Colosso's self-assured style may not be to everyone's liking, but he is a formidable character, respected by retail giants such as Aviva and RSA. - Gallagher must make sure Heath hits the ground running. While it is established in the affinity space, having lined up deals with RAC, Elephant and the Royal Yacht Association, rivals will be ready to swoop. - Heath is also big in the state sector. It has managed to hold onto Crossrail, but can it withstand the pressure from government cuts? Further diversification may be needed. - Gallagher paid a fair price for Heath - 6.7 times earnings is roughly in line with valuations. After months of haggling, they came to a sensible deal.